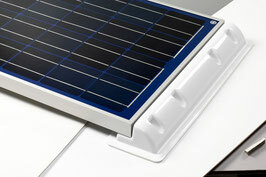 The ABS brackets exactly match the solar panel widths and can also be used for other makes of solar panels. Also available are corner brackets and connector brackets. The brackets are glued onto the vehicle roof with our special ABS adhesive (FIX PACK), the solar panels are connected to the spoilers by using screws.